Run defense. It starts and ends with an attitude and tackling, and the Raiders Sunday did neither, allowing Tampa rookie back Doug Martin to run crazy in a wild 42-32 loss to the Buccaneers at home. The loss ends Oakland’s two-game winning streak, and drops them to 3-5 on the season, 2-2 at home. Martin, coming off a solid game in Minnesota a week ago, ran for 251 yards and four touchdowns, as the Raiders never seemed able to stop him when they needed to. Another rough spot was losing leading RB Darren McFadden, as he departed in the second quarter with a leg injury after gaining just 17 yards on seven carries. X-rays taken proved negative. Carson Palmer threw for 414 yards and four touchdowns but was intercepted three times on 39-of-61 efficiency for the Raiders, who drop to 3-5, 2-2 at home. Josh Freeman finished 18-of-30 for 247 yards and a pair of scores through the air for the Buccaneers (4-4), who have won three of their last four outings. Mike Williams added 68 yards and one touchdown on four receptions, with Vincent Jackson posting a TD grab to cap Tampa’s first-ever win in Oakland. Marcel Reece led the receiving corps with 95 yards and one score on eight catches, while Brandon Myers totaled two TD receptions and 59 yards in a losing cause. 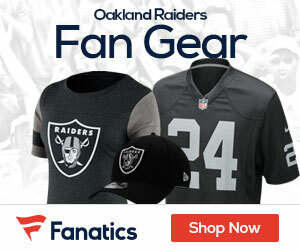 Down big, the Raiders began their comeback effort early in the fourth as Palmer hit Myers, who dove for the pylon on a four-yard TD pass and a 28-17 contest. Martin struck back, this time for a 70-yard TD, to make it 35-17 on the visitors’ next play from scrimmage, but the hosts came right back with a 1- yard Palmer-to-Myers connection. Though the Bucs recovered an onside kick, Oakland recovered a LeGarrette Blount fumble at its own 35. Eleven plays later, Reece’s 13-yard touchdown reception pulled the hosts within 35-30. Juron Criner‘s leaping catch in the end zone made it a three-point spread with 3:51 to play. Oakland got the ball back with 2:42 on the clock, at its own 38-yard line. Two plays in, Palmer was picked off by Ahmad Black, who returned the ball to the Raiders’ 22. Martin handled the ball on all three plays, and his one-yard dash provided a 42-32 advantage with 1:49 to go. E.J. Biggers then intercepted Palmer on the following series, and Tampa ran off the remaining time in four plays. Sebastian Janikowski’s 29-yard field goal was the lone score of the opening quarter. Tampa Bay responded on its next series, which bled into the second period, as Freeman connected with Jackson in the back-right corner of the end zone for a 20-yard touchdown. 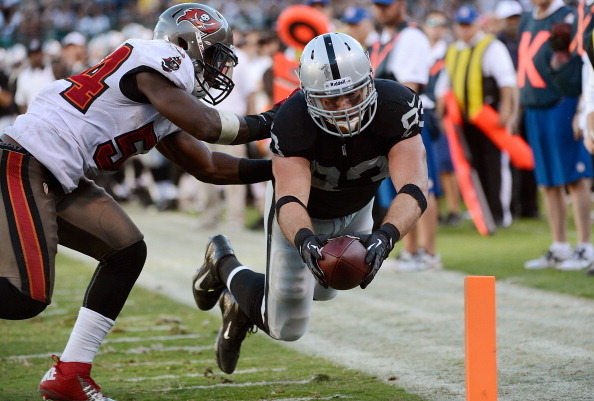 Oakland took the lead back with 1:20 to play before halftime, as Rod Streater hauled in a 25-yard heave from Carson. The Bucs made it to the Raiders’ 36-yard line as time wound down, but Connor Barth’s 54-yard try fell short and wide left on the final play. Martin broke several tackles en route to a 45-yard touchdown run to give Tampa a 14-10 lead on its first drive of the second half, then Williams was able to grab a Freeman pass in the end zone from four yards out just past the midway point of the third quarter for a 21-10 edge. Martin added another long jaunt, a 67-yard dash to paydirt, to put the Bucs ahead 28-10 with 2:15 remaining in the quarter. Oakland, CA. Impressive comeback, like we haven’t seen in a long time from a Raiders team! I felt sorry for CP3 because he was playing outstanding football (until our last drive, when we had a chance to tie or go ahead). I began wondering if DMoore is dyslexic. The look in Carson’s eye after several passes. You could tell that he expected Moore to do something else, usually the opposite of what he did, on 4 or 5 passes! And yet CP3 never blamed anyone, never got on his young receivers. I hope this great young receiver and his QB spend a lot of time together this week taking extra reps. Meanwhile, obviously Tampa made an adjustment in their run scheme in the second half, and the Raiders did not. When Martin got to the second level, we had no backside help. Finally, does anybody know when OT Barnes is going to return? Somebody is going to get hurt soon if we don’t address the RT position.